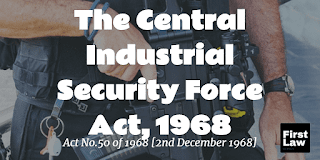 Central Industrial Security Force Act, 1968 - Section 15 - A plain reading of the provision indicates that the member of the Force is considered to be always on duty. Central Industrial Security Force Act, 1968 - Section 15 - Special Disability Leave claim - As long as there is an element of discharging official duties at the time of occurrence of the injury, the eligibility requirement would stand fulfilled. Army Law - The courts have held that the attribution to injury in military service has to be understood in wide spectrum. It does not however mean that the principle of prudence and reasonableness would be ignored while determining such questions. Each case would have to be examined in accordance with its facts. Central Industrial Security Force Act, 1968 - Section 15 - Special disability leave for accidental injury - Scope of the provisions for grant of Disability Pension - Scope of Provisions for grant of Special Disability Leave - Attributability of the injury to Official Duties / Official Position - Causal Connection - Discussed. The injury was accidentally incurred by the Petitioner on a day when he was proceeding to his home town on sanctioned leave. Petitioner would not have been entitled to leave his duty without the permission and authorization by CISF. Petitioner had a valid leave certificate and thus he was undertaking the journey under authorization. Petitioner’s activity at the time of the injury cannot be said to be entirely alien to his official duty. Petitioner was proceeding to his home town on authorized leave and therefore he was doing an act that was essential for him to avail his leave at his home town duly authorized by CISF. The accidental injury has occurred as a consequence of the Petitioner's official duties. Thus there is apparent and requisite nexus which provides a causal connection between the injuries suffered by the Petitioner and his official duties. BHAGU RAM ..... Petitioner Through: Mr. P. Sureshan, Advocate. versus UNION OF INDIA AND ORS ..... Respondents Through: Mr. Akshay Makhija, CGSC for UOI/R-1 to 3 with Ms. Seerat Deep Singh and Ms. Mahima Bahl, Advocates. 1. The Petitioner who is working as Constable with Central Industrial Security Force (CISF) has filed the present petition under Article 226 of the Constitution of India challenging the orders passed by the Respondents declining to regularize 317 days of leave as special disability leave. 2. The brief facts leading to the filing of the present petition are that the Petitioner applied for leave for going to his home at Village Khandwa on 29th November 2010. His request was acceded to and he was granted leave from 30th November, 2010 to 5th December, 2010. Accordingly, the Petitioner availing the four days sanctioned leave, left for his home on 30th November, 2010 at about 6.00 pm. Unfortunately, while crossing the service road in front of INA Market, New Delhi a motor cyclist who was driving at high speed hit him. As a result of the impact, Petitioner suffered serious injuries and fractured his leg. He was admitted at Safdarjung Hospital and was given the necessary treatment. 3. The Company Commander, CISF sent an accident report to the Unit Commandant on 1st December, 2010 and vide letter dated 22nd December, 2010, Petitioner was granted one month medical leave. This was followed by a letter recommending two months’ home rest w.e.f. 22nd January, 2011. Since the Petitioner was still undergoing treatment, after the expiry of one month’s home rest, he requested for three months’ extension. This request was accepted by the Respondents. Petitioner was again admitted in Hospital and had to undergo another operation on his leg on 11th July, 2011. This was also brought to the notice of the Commandant vide letter dated 12th July, 2011 written by the Assistant Commandant of the CISF to the Commandant of the CISF. By Note-sheet dated 19th July, 2011, Petitioner was recommended home rest, as he was not in a position to move. 4. A leave certificate dated 16th August, 2011 was issued to the Petitioner approving 28 days leave from 16th August, 2011 to 13th September, 2011 followed by a Note sheet dated 13th September, 2011 recommending him one month’s rest. On 13th October, 2011, Petitioner submitted his fitness certificate and two days later on 15th October, 2011, the Office of the Deputy Commandant ordered to conduct an inquiry to ascertain the reason of the Petitioner’s accident and the resultant home rest. The concerned Officer submitted his report on 26th November, 2011 and observed that Petitioner required long medical leave on account of the treatment being received by the Petitioner. 5. Thereafter, the Deputy Inspector General vide letter dated 17th October, 2013 sought certain clarifications from the Petitioner for regularization of his medical leave. On requisite information being provided, CISF vide letter dated 3rd April 2014, informed the Petitioner that the Court of Inquiry conducted by the GBS New Delhi has observed that “since the injury suffered by Constable Bhagu Ram was while going on leave, hence the injury is not attributable to service.” Based on the finding that the accident took place while the Petitioner was on leave and not on official duty, Petitioner was held not eligible for Special Disability Leave for the sick/medical rest period of 317 days w.e.f. 30th November, 2010 to 12th October, 2011. 6. Dissatisfied with the above response, Petitioner preferred an appeal before DG Headquarter. However, the said appeal was also rejected vide order dated 22nd December, 2014. The revision petition filed against the said order was also rejected but on the ground that there was no provision to consider the same. 7. The Petitioner has approached this Court assailing the orders dated 3rd April, 2014 and 22nd December, 2014. 8. The learned counsel for the Petitioner argued that the action of the Respondent declining to regularize his disability leave is illegal, as the Petitioner is a member of Armed Paramilitary Forces and should be treated on duty even when he proceeded on authorized leave. In support of his submission, he relied upon the decisions of the Supreme Court in Pension Sanctioning Authority, PCDA (P) Allahabad v. M.L. George, Ex , (2015) 15 SCC 399, Union of India v. Smt. Roshini Devi, 2010 SCC Online P & H 7525, Ex. Constable Avtar Singh v. Union of India 2015 SCC Online P & H 1442, Sukhwant Singh v. Union of India through the Secretary, Ministry of Defence, (2012) 12 SCC 228 and of this Court in Mr. Jitender Kumar v. Chief of Army Staff (2007) LAB I.C 141. 9. Learned counsel further asserted that the Petitioner was in service uniform at the time of the accident and was proceeding to his home with the leave certificate issued by the CISF after following all the mandatory directions and therefore he should be considered to be on duty at the time of the accident. Additionally, he argued that Armed Paramilitary Personnel working with CISF are always under the disciplinary control of the organization and that he shall be deemed to be on duty even when he is travelling to his home town with specific leave certificate and warrants obtained from his unit. 10. Mr. Akshay Makhija, Central Government Standing Counsel, on the other hand, argued that the judgments relied upon by the Petitioner are inapplicable to the facts in hand, as the same concerns the grant of disability pension and not disability leave. He further distinguished the said judgments on facts by arguing that the said case law would govern only the officers of Indian Army who are governed by Defence Service Regulations. He submitted that there is a specific provision in the Regulations that entitled the Army Personnel to disability pension and therefore the said judgments would not have any persuasive value in the facts of the present case. He urged that the present Petitioner being member of CISF, will be governed by CCS (Leave) Rules. The said Rules do not contain any provision enabling him similar benefits as are available to Indian Army officers. Lastly, referring to Rules 44 and 45 of the above stated Rules he submitted that the injury inflicted on the Petitioner was on account of motor accident and the same has no correlation to his official duties. 11. The Petitioner is a Constable with CISF and has suffered an injury on account of road accident on the day when he proceeded on the sanctioned five days earned leave (EL) w.e.f. 30th November, 2010. Since on the fateful day he was on an EL, an interesting legal question that arises for consideration is whether the Petitioner would be entitled to special disability leave on account of the above stated injury. 48. (a) Unless otherwise specifically provided a disability pension consisting of service element and disability element may be granted to an officer who is invalided out of service on account of a disability which is attributable to or aggravated by military service in non-battle casualty cases and is assessed at 20 percent or more. (b) The question whether a disability is attributable to or aggravated by military service shall be determined under the rules in Appendix II. 12. A person subject to the disciplinary code of the Armed Forces is on “duty. c. During the period of participation in recreation and other unit activities organized or permitted by Service Authorities and during the period of travelling in a body or singly by a prescribed or organized route. * We have noted that the Pension Regulations for the Army, 1961 have been superseded by the Pension Regulation for the Army, 2008. However, Pension Regulations, 1961 are still applicable to those personnel to whom no provision is made in Pension Regulation for the Army, 2008. (ii) existed before or arose during Government service and has been and remains aggravated thereby. (ii) the aggravation by Government service of a wound, injury or disease which existed before or arose during Government service. 4. (a) (i) Injuries sustained when the man is 'on duty' will be deemed to have arisen in, or resulted from, Government service ; but in cases of injuries due to serious negligence or misconduct, the question of reducing the disability pension will be considered. (ii) In cases of self-inflicted injuries while on duty, attributability will not be conceded unless it is established that service factors were responsible for such action ; in cases where attributability is conceded, the question of grant of disability pension at full or at a reduced rate will be considered. (b) A person subject to the disciplinary code of the Central Armed Police Battalions, is 'on duty'. (i) When performing an official task or a task, failure to do which would constitute an offence, triable under the disciplinary code, applicable to him. (ii) When moving from one place of duty to another place of duty irrespective of the method of movement. (iii) During the period of participation in recreation, organized or permitted by service authorities, and during the period of travelling in a body or singly under organized arrangements. (iv) When proceeding from his duty station to his leave station on returning to duty from his leave station at public expenses, that is, on Railway warrant, on cash TA (irrespective of whether Railway warrant/cash TA is admitted for the whole journey or for a portion only), in Government transport or when road mileage is paid for the journey. (v) When journeying by a reasonable route from one's official residence to and back from the appointed place of duty irrespective of the mode of conveyance, whether private or provided by the Government. Superscript 1 means Substituted by G.I., Dept. of P. & P.W., O.M. No. 33/1/89-P. & P.W. (K), dated the 22nd January, 1992. (c) An accident which occurs when a man is not strictly 'on duty' as defined above, may also be attributable to service, provided that it involved risk which was definitely enhanced in kind or degree by the nature, conditions, obligations or incidents of his service and that the same was not a risk common to human existence in modern conditions in India. Thus, for example, where a person is killed or injured by someone by reason of his belonging to an Armed Police Battalion (and in the course of his duty in such service, he had incurred wrath of such person) he shall be deemed to be 'on duty' at the relevant time. This benefit will be given more liberally to the claimant in cases occurring on 'active service' as defined in the relevant Acts/Rules (e.g., those applicable to BSF/CRPF, etc., Personnel). a. Personnel of the Central Armed Police Battalions participating in (i) local/national/international sports tournaments as member of service teams, or (ii) mountaineering/gliding expeditions organized by the service authorities, with the approval of Government, will be deemed to be 'on duty' for purposes of the entitlement rules of disability and family pension. b. The above personnel participating in the above-mentioned sports tournaments or in privately organized mountaineering expeditions or indulging in gliding as a hobby, in their individual capacity, will not be deemed to be 'on duty' for purposes of those rules, even though prior permission of the competent service authorities may have been obtained by them. c. Injuries sustained by the above personnel in impromptu games and sports outside parade hours, which are organized by, or with the approval of, the local service authority, and deaths arising from such injuries will be regarded as having occurred while 'on duty' for purposes of these rules. 15. The aforesaid Rules clearly contain specific provisions which deal with the concept of deemed to be “on duty”. Both, in Defence Services Regulations as well as in Central Services (Extraordinary Pension Rules), an enabling provision has been incorporated that entitles a person to the benefits of disability pension if he/she is deemed to be “on duty”. During the period when he/she proceeds to his leave station or is returning to duty from his leave station, the officer gets the benefit of the deeming provision. 16. In this context, several judgments have been delivered by the Supreme Court, some of which have also been relied upon by the Petitioner and it would be appropriate to note a few. "48. Disability pension when admissible-An officer who is retired from military service on account of a disability which is attributable to or aggravated by such service and is assessed at 20 per cent or over may, on retirement, be awarded a disability pension consisting of a service element and a disability element in accordance with the regulations in this section;"
(c) A person is also deemed to be 'on duty' during the period of participation in recreation, organized or permitted by service authorities and of travelling in a body or singly under organized arrangements. A person is also considered to be 'on duty' when proceeding to his leave station or returning to duty from his leave station at public expense." 173 Unless otherwise specifically provided a disability pension consisting of service element and disability element may be granted to an individual who is invalided out of service on account of a disability which is attributable to or aggravated by military service in non-battle casualty and is assessed 20 per cent or over. The question whether a disability is attributable to or aggravated by military service shall be determined under the rule in Appendix II. 6. A bare reading of this provision clearly shows that two essential conditions, which a claimant is required to satisfy are that his disability is 20% or over and the disability is attributable to or aggravated by military service in non-battle casualty. Once these two ingredients are satisfied, the claim deserves merits. The question whether a disability is attributable to or aggravated by military service shall be determined under the rule in Appendix-II. Though Appendix II has been titled as "Entitlement Rules for Casualty Pensionary Awards, 1982", it specifically refers to Regulations 48, 173 & 185 of the Regulations. Appendix II does not determine the grant or refusal of disability pension but reference to this Appendix is essential only for the purpose of answering the question of attributability and/or aggravation by military service. To say that the Entitlement Rule in Appendix II overrides the provisions of Regulation 173 would be offending the known can one of statutory interpretation. 7. Appendix II is a mere supplement to the substantive Regulations 48 and 173 and cannot frustrate what is granted by the substantive provisions. It only indicates as to what kind of factors are to be taken into consideration for determining aggravation/attributability to military service. To lay unnecessary emphasis on this Appendix and its various clauses in depriving what is granted in Regulation 173 would neither be just nor permissible." 19. A similar view has been taken by the Full Bench of Punjab and Haryana High Court in the case of Union of India v. Khushbhash Singh ILR (2010) 2 P & H 472 (FB) and the Division Bench of Punjab and Haryana High Court in UOI v. Roshni Devi (Supra). 20. From the above, it can clearly be seen that there is a consistent view taken by the Supreme Court and various other High Courts and thus it can be said that it is no longer res-integra that a person who is governed by the provisions of the Army Act, would be treated on duty when proceeding to his leave station or returning to duty from his leave station at public expense and hence would be entitled to the benefits accruing therefrom in accordance with law. 22. Thus, it appears that the officers, who are be governed by CCS (Extraordinary Pension ) Rules, would be treated to be “on duty” when they proceed on casual leave or are returning from leave for the purpose of taking benefit of disability pension, subject however to fulfillment of the other conditions as specified in the aforesaid provision. 23. In the present case, we are concerned with Special Disability Leave arising out of an injury and therefore we now proceed to examine the relevant rules for this entitlement. (1) The authority competent to grant leave may grant special disability leave to a Government servant (whether permanent or temporary) who is disabled by injury intentionally inflicted or caused in, or in consequence of the due performance of his official duties or in consequence of his official position. Provided that the authority competent to grant leave may, if it is satisfied as to the cause of the disability, permit leave to be granted in cases where the disability manifested itself more than three months after the occurrence of its cause. (4) Special disability leave may be combined with leave of any other kind. (5) Special disability leave may be granted more than once if the disability is aggravated or reproduced in similar circumstances at later date, but not more than 24 months of such leave shall be granted in consequence of any on disability. (6) Special disability leave shall be counted as duty in calculating service for pension and shall not, except the leave granted under the proviso to Clause (b) of sub-rule(7), be debited against the leave account. Provided that a Government servant may, at his option, be allowed leave salary as in sub-rule (a) for a period not exceeding another 120 days, and in the event the period of such leave shall be debited to his half pay leave account. NOTE:- Leave salary in respect of special disability leave granted to a Government servant who has rendered service under more than one Government may be apportioned between the Governments in accordance with the normal rules. (8) (a) In the case of a person to whom the Workmen’s Compensation Act, 1923 (8 of 1923), applies, the amount of leave salary payable under this rule shall be reduced by the amount of compensation payable under Clause (d) of sub-section (1) of Section 4 of the said Act. (b) In the case of a person to whom the Employees’ State Insurance Act, 1948 (34 of 1948), applies the amount of leave salary payable under this rule shall be reduced by the amount of benefit payable under the said Act for the corresponding period. (ii) to a civil servant not so discharged who suffers a disability which is certified by a Medical Board to be directly attributed to his service with a military force. (b) In either case, any period of leave granted to such a person under military rules in respect of that disability shall be reckoned as leave granted under this rule for the purpose of calculating the period admissible. (1) The provisions of Rule 44 shall apply also to a Government servant whether permanent or temporary, who is disabled by injury accidentally incurred in, or in consequence of, the due performance of his official duties or in consequence of his official position, or by illness incurred in the performance of any particular duty, which has the effect of increasing his liability to illness or injury beyond the ordinary risk attaching to the civil post which he holds. 25. It can be seen from the above that the Rules dealing with disability leave, in fact, do not provide for the rigour of the officer/ claimant being “on duty” or “deemed on duty” in order to avail the benefits of Special Disability Leave. The language of Rule 45 of CCS (Leave) Rules 1972 that concerns Special Disability Leave arising on account of accidental injury makes it clear that the aforesaid provision is wide enough and can be invoked by the Government Servant, “who is disabled by injury accidentally incurred in, or in consequence of the due performance of his official duties or in consequence of his official position". The wording makes it abundantly clear that the Government Officer would be entitled to the Special Disability Leave in case the injury is relatable to the performance of the official duties and also in a case where the same has occurred in consequence of his official position. The emphasis is on the expression “due performance of his official duties” or “in consequence of his official position”. The provision does not require that for disability leave, the accidental injury necessarily be inflicted at the time when an officer is “on duty”. The expressions “due performance” and “in consequence” take within their realm the span of time when the Officer may not be on active duty and is not actually performing the duties. "A perusal of the language of the Rule makes it abundantly clear that the Rule is not restricted in its application to injuries which arise in the performance of official duties alone and the language of the Rules is wide enough to include all injuries "caused in or in consequences of", the discharge of "official duties or in consequences of his official position". Thus, it is clear that an employee is entitled to the benefit of special disability leave in case he is disabled by injuries caused not just in the performance of his official duties but also in consequence of his official position." 27. This brings us to another legal aspect, concerning the question of causal connection. 28. We note that the High court of Madhya Pradesh, in the facts of the said case perhaps did not deem necessary to examine the question relating to the causal connection of the injury. While noting the divergent views of the Supreme Court in the case of General Manager, B.E.S.T Undertaking, Bombay v. Mrs. Agnes (1963) II LLJ 615 SC and Employees' State Insurance Corporation v. Francis De Costa (1997) ILLJ 34 SC, the Court noted that the question was academic and did not consider it necessary to decide the applicability of the judgments. In the present case, the Respondents have particularly raised the objection of the Petitioner's eligibility on the ground that the injury had not incurred as a consequence of due performance of the Petitioner’s official duties and therefore, we are examining this question as well. 173. Unless otherwise specifically provided a disability pension consisting of service element and disability element may be granted to an individual who is invalided out of service on account of disability which is attributable to or aggravated by military service is non-battle casualty and is assessed at 20 percent or over. 30. The causal connection has been subject matter of several decisions of the Supreme Court. Invariably, the stand of the Respondent is that an injury suffered during leave period has no causal connection with employment. In many recent decisions, the Supreme Court has held that an employee would be entitled to Disability Pension even if the injury is sustained when an employee is on casual leave. Though majority of the decisions are in the context of Disability Pension, but the ratio of the said judgments would still be applicable to the facts of the case in so far as it relates to the question of determination of causal connection. We would like to note few decisions of the Supreme Court on the subject. "13. If the expression "at public expense" is to be construed literally then under the Rules referred to above, an army personal incurring a disability during his travel at his own expenses will not be entitled to the benefit of Rule 6(c) (supra). The object of the rule, as we see, is to provide relief to a victim of accident during the travel. If that be so, the nature of expenditure incurred for the purpose of such travel is wholly alien to the object of the rule." 32. It thus emerges that the courts have repeatedly held that the legislative intent is towards the liberal construction of the provisions. The Courts have held that the intent is to give the wider scope while considering the question of the attributability of the injury to the service. (1) Every 51 [***] member of the Force shall, for the purpose of this act, be considered to be always on duty, and shall, at any time, be liable to be employed at any place within 52 [or outside] India. 34. A plain reading of the aforesaid provision indicates that the member of the Force is considered to be always on duty. 35. Special Disability Leave claim can arise on account of injury or a disease/illness. The causal connection of the disability in the case of disease/illness becomes an intricate and complex question as it requires determination whether the employment contributed to the disease/injury suffered by an employee. However, in the present case the causal connection has to be examined in relation to the injury accidentally incurred. "(8) “ employment injury" means a personal injury to an employee caused by accident or an occupational disease arising out of and in the course of his employment, being an insurable employment, whether the accident occurs or the occupational disease is contracted within or outside the territorial limits of India"
37. The ratio of the said judgment would not be applicable to the facts of the present case where the causal connection has to be determined in light of distinct rules as discussed above. We have also noticed the recent judgments of the Supreme Court wherein it has consistently held that injury suffered by an officer during casual leave would not render him ineligible to disability benefits. The courts have held that the attribution to injury in military service has to be understood in wide spectrum. It does not however mean that the principle of prudence and reasonableness would be ignored while determining such questions. Each case would have to be examined in accordance with its facts. In this regard reference may be made to judgments passed by this Court in the case of Ex. AC Somveer Rana v. Union of India WP (C) No. 2418/2004, Ex. Hav (AEC) Bhup Singh v. Union of India WP (C) No. 2325/2005, Hayat Mohammed v. Union of India (2007) 138 DLT 537 and Supreme Court in Union of India v. Surendra Pandey, (2015) 13 SCC 625. We are also conscious that most of the decisions of the Supreme Court and the Coordinate Bench of this Court are concerning the Officers of the Indian Army, but that would not render the ratio inapplicable to the present case on the question of causal connection viz the attribution of the injuries to the official duties/official position. 38. In view of the above discussion, the petition is allowed. The orders dated 3rd April 2014 and 22nd December 2014 are set aside. Respondents are directed to regularize the leave of the Petitioner as Special Disability Leave as is permissible under the CCS (Leave) Rules. The consequential orders be passed within a period of four weeks. No order as to costs.